UPORE® is an essential material for primary and secondary lithium-ion batteries. It has a uniform microporous structure, developed using UBE's proprietary technology, and comes in either single or multi-layer membranes. 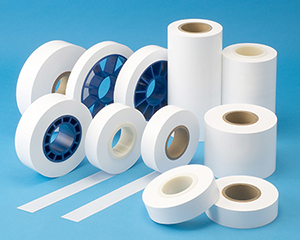 Delivers superior solvent and chemical resistance thanks to the use of polyolefin as a raw material. Manufactured using a dry process (lamellar crystal stretching method) that does not use solvents or inorganic fillers. Comes in polypropylene or polyethylene mono-layer products, as well as multi-layer products that combine both these materials. The use of polypropylene and polyethylene layers delivers low-temperature shutdown and high-temperature heat resistance. No Traverse Direction shrinkage because a uniaxial stretching method is used. Environmentally-friendly and contaminant-free because a dry manufacturing method is used. Membrane thickness and permeability can be modified as required by customers.